If a used car is next on your shopping list, the Toms River VW team would like to direct your attention toward a used Volkswagen Golf. The VW Golf is a fully accommodating compact car with plenty to offer drivers in Toms River, Brick, and Freehold. Below are several of its noteworthy highlights. Take a brief moment to learn all about it then contact us to schedule a test drive! The used Volkswagen Golf has an interior that supplies you and everyone you’ve got on board with an abundance of potential to relax, stretch out, and enjoy the ride. It easily seats five passengers and has an overall passenger volume of 93.5 cubic feet. The front seats have a headroom measurement that comes to 38.4 inches, 55.9 inches of shoulder room, and 41.2 inches of legroom. The measurements for the back seats are almost identical at 38.1 inches of headroom, 53.9 inches in terms of shoulder room, and 35.6 inches when it comes to legroom. Even with all of this wiggle room, the VW Golf offers you lots of opportunity for stowing grocery bags, luggage, and anything else you might need along the way with 22.8 cubic feet of cargo volume. Not only does the used Volkswagen Golf provide you with a comfortable driving experience, but it also offers quite a lot of convenience. For instance, it keeps you and your passengers connected throughout the drive with standard features like Bluetooth® technology with audio streaming for compatible devices, a USB port, and the Volkswagen Car-Net® App-Connect. The VW Golf is also available with such conveniences as power-operated side mirrors, heated windshield washer nozzles, a panoramic sunroof that features power-tilting and -sliding, and keyless access with push-button start. In the area of safety, the used Volkswagen Golf continues to impress. It comes standard with the Rear-View Camera System that provides you with a boost in your awareness. The available Blind Spot Monitor accomplishes this by alerting you when a vehicle is occupying your blind spot to allow you to change lanes with increased confidence. The also available Active Blind Spot Monitor takes things a step further by applying counter-steer if you attempt to exit your lane while a vehicle is in your blind spot. 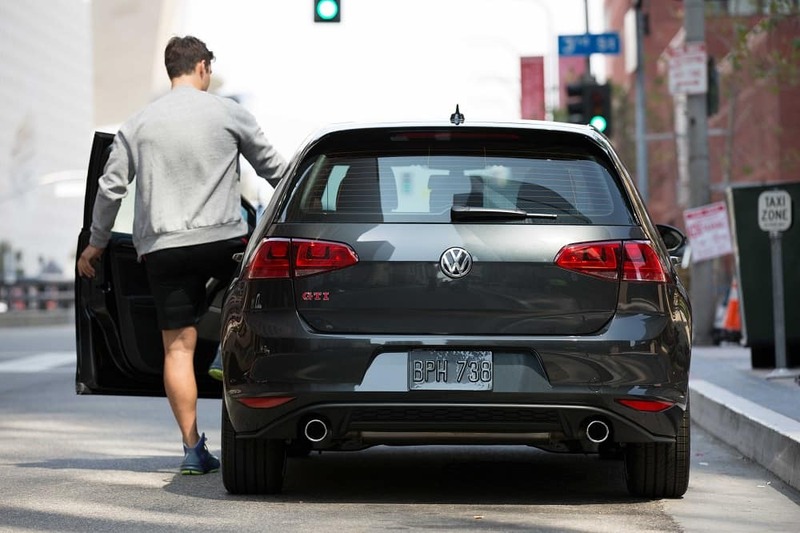 Other safety features that you’ll find in the Volkswagen Golf that are sure to make quite a difference are the Forward Collision Warning and Autonomous Emergency Braking, Rear Traffic Alert, and the Pedestrian Monitoring features. All three of these useful driving aides are intended to supply you with a reassuring driving experience from start to finish. As you can see, the used Volkswagen Golf contains a wide array of impressive attributes. If you’re in the Toms River, Brick, and Freehold areas and you’re ready to find out what else this well-equipped compact car has up its sleeve, find a used car dealer near you to get started!